Google boss's absence at US-China internet forum meet raises eyebrows. The photograph below has some of the world’s powerful technology leaders in one frame. We would have said all of the world’s powerful tech titans, but for one notable exception. Chinese President Xi Jinping (front-row-centre), poses for a photo with a group of CEOs and other executives at Microsoft's main campus in Redmond, Washington, on September 23, 2015. In the front row (left to right): Facebook's Mark Zuckerberg, JD.com's Liu Qiangdong, Cisco's John Chambers, Alibaba's Jack Ma, IBM's Ginni Rometty, Chinese President Xi Jinping, Microsoft's Satya Nadella, China's Internet czar Lu Wei, Apple's Tim Cook, Tencent's Pony Ma, and Amazon's Jeff Bezos. In the middle row (L-R): Sohu's Zhang Chaoyang, AMD's Lisa Su, Lenovo's Yang Yuanqing, Microsoft's Harry Shum, Qualcomm's Steve Mollenkopf, CETC's Ziong Qunli, Intel's Brian Krzanich, Qihoo 360's Zhou Hongyi, LinkedIn's Reid Hoffman, and SINA's Cao Guowei. Back row (L-R): Sugon's Li Jun, Didi-Kuaidi's Cheng Wei, Broadband Capital's Tian Suning, CEC's Liu Liehong, Baidu's Zhang Yaqin, AME Cloud Ventures' Jerry Yang, Inspur's Sun Pishu, AirBnB's Brian Chesky, and Sequoia Capital's Shen Nanpeng. Photograph: Ted S Warren/Reuters Pool. 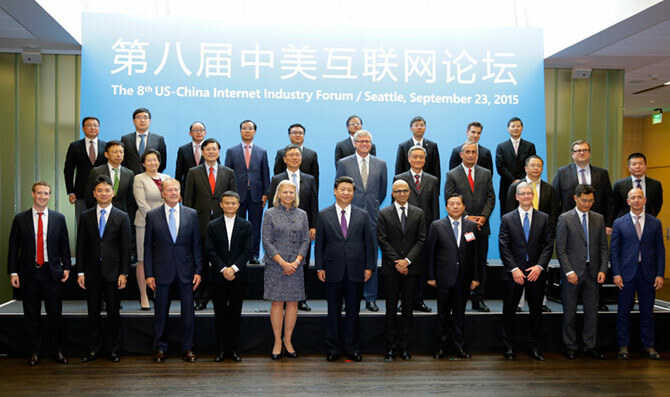 The event was the 8th US-China Internet Industry Forum, held at the Microsoft headquarters in Redmond, Washington, which was attended by top CEOs like Apple’s Tim Cook, Microsoft’s Satya Nadella, Amazon’s Jeff Bezo, Facebook’s Mark Zuckerberg (the world’s most popular social networking site is banned in China, btw) – apart from Chinese President Xi Jinping. The notable exception, as you can see, was Pichai who, incidentally, put out a video welcoming Prime Minister Narendra Modi to the United States. Like FB, Google is also banned in China. Among the Chinese CEOs were the embattled Alibaba’s Jack Ma and Lenovo’s Yang Yuanqing. The Chinese president was in the US West Coast to meet with business chiefs before heading to Washington, DC, for a summit with President Barack Obama. At the forum meeting on Wednesday, President Xi was buttonholed by Zuckerberg who spoke to him in Chinese; the Facebook CEO speaks Chinese fluently. Will Google’s loss, then, be Facebook’s gain?